I can’t think straight enough to knit much, but there’s been some spinning. The dye would not exhaust on this. I had to reset it by soaking in water and citric acid, then bringing to 190F on top of the stove and holding there for 30 minutes. Grumble. Purchased at Rhinebeck 2007. See the batts here. This was a rustic prep and it resulted in a rustic yarn. 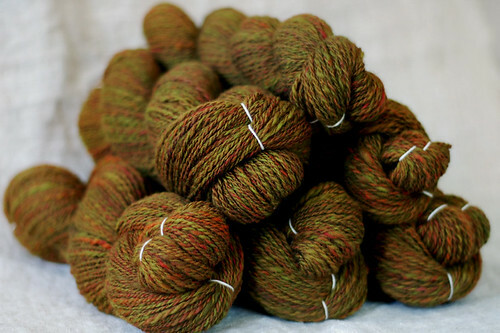 There were big blobs of Alpaca (the red, orange, and paler green) that didn’t blend well with the wool. This is a nice, fluffy, light yarn. Very soft! Merino wool, from my hand-dyed top. 250 yards and 2.6 oz. This was spun from scraps left from wool I sold. I think I’m going to crochet a blanket with these small scrap skeins. They’re super fun to spin. Spinning up about a pound and a half of “Hive” Falklands wool, the Hello Yarn Fiber Club April ’08 fiber. 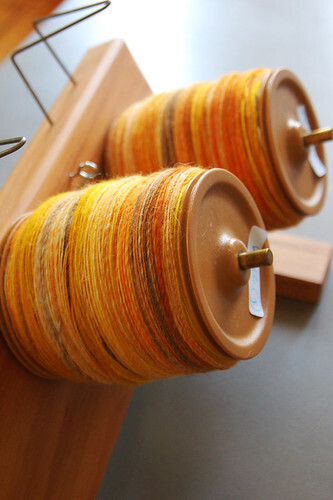 PS: The little stickers on the bobbins tell me how much, in weight, is on each, plus in which order they were spun. I spin in dribs and drabs and don’t trust that my spinning will be perfectly consistent from the beginning to the end of a project. This way, I can ply bobbins 1 and 4 together, and 2 and 3 together, etc. to help even things out. I keep track of the weight because I am a pretty darn consistent spinner (despite my lack of self-trust), so if each bobbin has 250 grams on it, chances are there will only be a few inches of one single left from two-plying. The system works well! Amy Boogie taught me. We haven’t moved yet, but think we’ve finally found a house. It’s been kind of a brutal search, since we have to drive 300 miles every time a house we like the looks of comes onto the market. It’s got a sweet little plumbed room with a big bright window for my dyeing, lots of space for drying, and a barn that we’ll eventually convert to a dye space for me. There’s a garden with blueberry and raspberry bushes and super nice neighbors. It’s in a beautiful quaint village filled with artists and local-eaters and other assorted lovely people. We’re so excited! I’ll keep everyone posted. Does Firefox 3.0 hate you as much as it hates me? Nothing works right. hurrah!! congrats on the house find. may moving be smooth and settling be fabulous. you have my permission to move there. it’s less than 2 hours away from my house. sounds very exciting!!!!!! if it’s the one you posted on Flickr, it’s adorable! Excellent news! I’ve been looking at all the houses you posted on FLickr – this last one looks awessome! 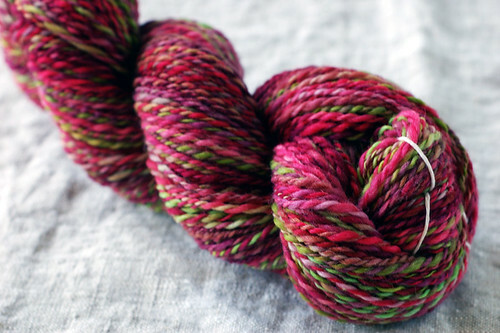 Great job on all the handspun too – I can’t wait for your next shop update! Thanks for posting! I have missed your artistic outlook on life. Congrats on the house and keep up the stunning spinning — it looks lovely! Makes me want to spin, yum yum! Good luck with the house stuff, nothing is more exciting than getting the call that the house is yours! And yes, my husband said, update, update, and firefox is boo for me too. Congrats on finding a house!! Congrats on finding a house! I hope everything works out for you with this one. Congrats and good luck on the house! Can’t wait for the shop update…you put it up, we’ll certainly buy it! Firefox 3.0 is absolute crap! I hate it so much I switched to Avant til it gets fixed. For all the searching I hope this is the house for you :) And yes, I’ll buy as much as possible, that’s if I can get ahead of everyone who’s thinking the same as me about your update!Gorgeous spinning there!!! Congrats on the house!! Sounds fantastic! Congratulations on the house! I’ll go check Flickr right now. I’m thrilled to hear you’ve found your house! The hunting is *so* hard – I used to come home and just cry after seeing some of these places that they were asking $32093480204 for, gadfrey! Can’t wait to hear more. Congrats on the house! Your spinning just kills me. Honestly. I have to figure out a way to go to Yarn School next year. You are doing it again, aren’t you? Oh my, you did an amazing job with those Spinner’s Hill batts! I’m in love with the colors and texture, can’t wait to see what you do with it. I’m keeping my fingers crossed your house search is really over and you’ve found the ONE. Great yarns. I love the spinner’s hill stuff. I haven’t even blinked at mine. I just dl’d 3.0 this am. it is behaving weird. Good thing you don’t live too close to me, or I might steal some of that pretty yarn! Ummmm gorgeous! 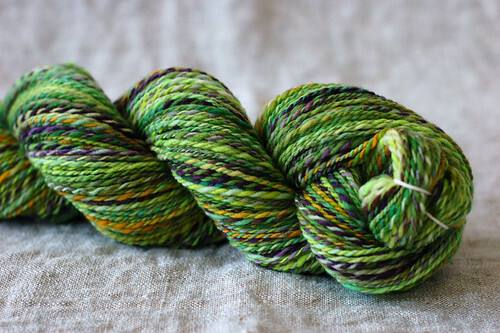 the yarn is incredible and i’m absolutely dying over the description of your house! dye-ing. Your spinning is so beautiful, I want to put pictures on my wall for inspiration. Fantastic. Congrats on finding a house! How exciting! The berry bushes would win me over for sure….